The new world/guild boss Mirumok Destroyer Offin has appeared! It is the Ancient Weapon that protected the Mirumok Temple. Learn the basic strategies and attack patterns before heading out to defeat this threat. ◆ Where can I fight Offin? There are two ways of finding Mirumok Destroyer Offin. First, Mirumok Destroyer Offin/Watcher Offin Tett appears as a guild raid boss through the repeatable guild quest ‘[Boss Subjugation] Watcher of Mirumok Ruins’. Second, ‘Mirumok Destroyer Offin’ appears as a world boss . Offin appears with a cry and a notification message just like all the other world bosses. Mirumok Destroyer Offin appears 30 minutes after this message is displayed. ▲ The Offin summoned for guild raids is at a different location from the Offin that appears as a world boss. ◆ Prepare to Fight Mirumok Destroyer Offin! The new world boss Mirumok Destroyer Offin is actually ‘Watcher Offin Tett’ riding the ‘Mirumok Destroyer Offin’. 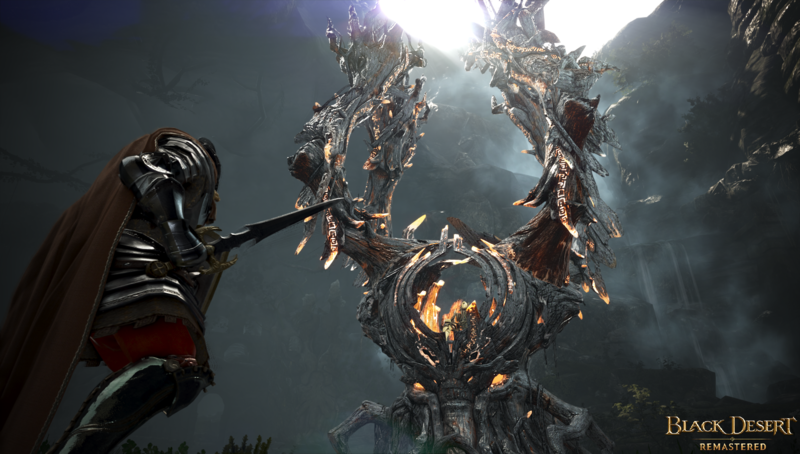 Unlike other world bosses, it has a variety of attack patterns. Therefore, it’s crucial to have a plan before starting this fight. Your ultimate goal is to destroy Watcher Offin Tett, who is riding Mirumok Destroyer Offin. However, Watcher Offin Tett is protected by a shield while it is riding Mirumok Destroyer Offin. ▲ Watcher Offin Tett is protect by a shield while it’s riding Mirumok Destroyer Offin. Here are some facts you should know before heading out to fight Mirumok Destroyer Offin. 3. ‘Mirumok Destroyer Offin’ and ‘Watcher Offin Tett’ die together. 4. Mirumok Destroyer Offin becomes extremely strong if a fight lasts longer than 15 minutes. Below you’ll find 3 different strategies used to defeat Mirumok Destroyer Offin. 1. Make Watcher Offin Tett dismount by destroying 1 of the roots. 2. Attack Watcher Offin Tett until its HP drops to 70% and make it go back in. 3. Destroy another root and make Watcher Offin Tett come out again. 4. Attack Watcher Offin Tett until its HP drops down to 30% and make it go back in. 5. Finish off Watcher Offin Tett after its shield is removed by destroying two or more roots. 5. Destroy another root other than the two roots that have already been destroyed to make Watcher Offin Tett come out again. 6. Finish off Watcher Offin Tett. 2. Destroy the force shield on Offin’s mount with matchlocks before the dismounted Watcher Offin Tett’s HP drops to 70%. * Watcher Offin Tett does not go back on the mount if the force shield is destroyed. 3. Finish off Watcher Offin Tett. There are numerous skills and attacks Mirumok Destroyer Offin uses and each one of them are very dangerous. Therefore, it’s important to know what the signs are and how to avoid them to increase your survivability during this fight. Sweeping the front – This is a basic attack done by Mirumok Destroyer Offin as it lifts a root and sweep an area. Get out of the area when it lifts its root. Poison Gas – Mirumok Destroyer Offin lifts its body then drops it down to spew out poison gas. Be especially careful of this move as the gas deals significant damage. Rumbling Earth – Mirumok Destroyer Offin lifts up its body and slams it down to do a shockwave attack. Ground Explosion – Mirumok Destroyer Offin lifts up its body and slams it down to cause the ground to explode and erupt with flames. Shining Spear – Watcher Offin Tett teleports out of the shield and appears on top of the mount to throw a shining spear. Shining Sphere – Watcher Offin Tett teleports out of the shield and appears on top of the mount to throw a shining sphere of light. Meteor Strike – Mirumok Destroyer Offin moves its body up and down and summon a falling meteor. Move close to Offin to dodge this attack. Clones – Watcher Offin Tett creates 2 clones of itself. You cannot damage the clones. The real Offin Tett glows yellow. Teleport – Watcher Offin Tett teleports to different locations. Slam – Watcher Offin Tett uses its fists as its basic attack to hit Adventurers. Heavy Stomp – Watcher Offin Tett jumps up and stomps the ground to deal damage in the surrounding area. Shining Spear – Watcher Offin Tett throws a shining spear that explodes and deals damage in an area after it hits the ground. Energy Eruption – Watcher Offin Tett charges up energy in its body and causes an explosion. You’ll see dirt flying in the air around Watcher Offin Tett while this skill is active. Stay away from its body when this effect appears as it deals a large amount of damage. You should always prepare knowledge on a boss before going to fight it. You can learn knowledge about Mirumok Destroyer Offin from the NPC Anbelif in Kamasylvia after you gain a certain amount of Amity with her. You can gain Amity by having conversations. 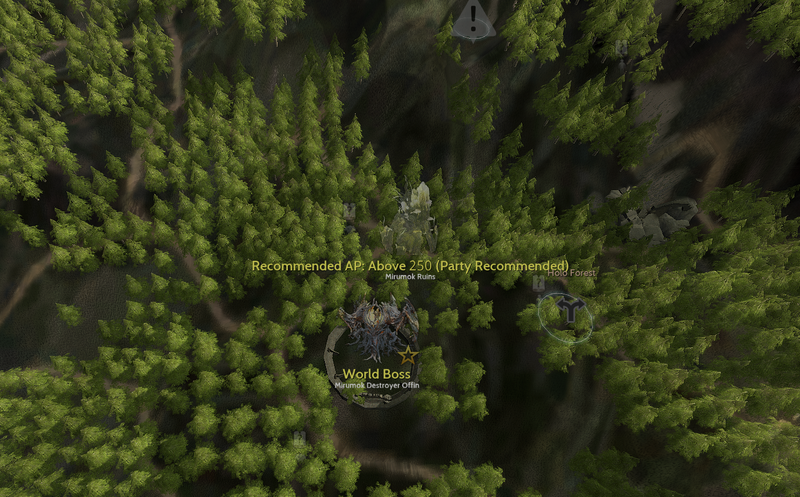 ▲ You can find <Kamasylve Saint> Anbelif at the top of the Old Wisdom Tree. You must have at least 7 different knowledges in ‘Kamasylvia Entrance Adventure Journal I’ to converse with her. There are 3 ways to get loot from Mirumok Destroyer Offin. One, you can get loot when ‘Watcher Offin Tett’ is defeated. Two, be one of the top 30 Adventurers that help destroy the root of Mirumok Destroyer Offin. Three, be one of the top 30 Adventurers that help destroy the Offin’s force shield. Adventurers in the top 30 will get additional items as rewards. So you can say that Adventurers can get more rewards at the end of the fight if they contribute more. The rare reward you would want to get from defeating ‘Mirumok Destroyer Offin’ is the ‘Offin Tett's Light Sealed Weapon Box’. You can open this box to get a ‘Offin Tett Radiant Weapon’. Offin Tett Radiant Weapon is a boss main weapon, like Kzarka Weapon. If you compare the two weapons, Offin Tett has lower accuracy but higher AP. Additionally, it gives Critical Hit +2 while Kzarka weapon gives +1 more of Attack/Casting speed. ▲ You can exchange 100 Offin Tett's Light Fragments for a ‘Offin Tett's Light Sealed Weapon Box’. Are you excited for the new world boss Mirumok Destroyer Offin? You’ll need to be that much better prepared as this fight is significantly different compared to other world bosses. Defeat Mirumok Destroyer Offin that appears once a week for your chance to get the new boss weapon!